You are currently browsing the category archive for the ‘The Cast 2008’ category. George Burns had his Gracie, Lucy had Ethel, Abbot had Costello, and the P.E.P. has been blessed with the dynamic duo of Barbara and JoAnne, proof that great things often come in pairs. The gals have been best pals for over two decades and have been frequent visitors over the years to the Lizzie Borden B&B, with both being regular guests every August 4th since the house was opened. In years gone by, Barbara’s mother, Mrs. Lucy Borden, a decendant of Lizzie’s great uncle Cook Borden, was a regular August 4th guest at the house. “Jo Jo and BoBo” are the leavening which makes any skit “rise” and after years playing various Borden case characters, their familiarity with the case makes for brilliant on -the- spot ad libbing which is always a crowd pleaser. Their combined high energy and grasp of the Victorian era, as well as an instant rapport with the audience bring out the best in any cast. Every performance is as fresh as the first, and every year an anticipation of what new twists the pair will bring. “Lady Barbara” and JoAnne are both enthusiastic members of the Second Street Irregulars and dedicated Mutton Eaters whose annual desserts at meetings are always a revelation! If the “Game is Afoot”, you can be sure these gals will be first out the door, dressed to the nines and leading the pack with all the fire usually attributed to redheads ! JoAnne as Mrs. Churchill with “Dr. Dolan”, Ted Gregoire. “Anyhow….. I was born in Lynn,Ma. A big city similar to FR. It was know as the shoe capital and had several shoe factories. It was quite the city in the 50’s. Unfortunately, as FR it has taken a down turn. I saw it happening once big malls were developed. Downtown disappeared! I graduated from Salem State College with a degree in elementary education. Right after graduation , I married and moved to Dedam and then Saugus where I was a permanent substitute teacher. What a job…yuck! I have two daughters, Katelyn and Leslie Anne. Later my husband and I owned and operated our own business. He did the work and I spent the money. He is now retired. I went to Woodstock in 1969….groovy man. I was one of the few who actually bought a three day ticket. I went with my two best friends at the time. I have some great memories. as a matter of fact, My husband and I last year were up around that way and I had him stop at the site. of course it has changed but in my eye it was 1969. I shed a couple of tears. The role of Bridget Sullivan, the Borden’s Irish maid, is the glue which connects the characters and revelation of the plot to the audience. No one who exited the house on August 4th could forget the letter- perfect Irish accent of Kathleen Troost-Cramer. With a mother whose maiden name was McMurphy, we might have a good idea where the great Irish brogue originated! Kathleen, a daytime tour guide at the house on Second Street for the past three summers, has no problem slipping into the humor, posture, and dialect of Bridget. With a B.A. in Theatre from Emerson College, Kathleen is no stranger to the actor’s life either. Currently Kathleen is pursuing her PhD in Biblical Studies at Boston University and manages to squeeze in a trip to Israel to work on an archeological dig, work during the week at the Lizzie Borden B&B Museum and pursue many other interests and hobbies. Kathleen’s husband Bob is sometimes seen behind the old black vintage stove at the Borden house as he ties on the apron to flip the jonnycakes on a weekend for overnight guests. Kathleen has a few ideas as to whodunnit: “I think Bridget is the most mysterious person in the case and knew more than she told in order to protect her reputation. Just what did she know? I believe John Morse killed Abby Borden that morning and an acquaintance of Morse’s later killed Andrew. Bridget unknowingly let Andrew’s killer in the house. After working here and seeing the layout of the house, my initial assumption that Lizzie was innocent soon disappeared. It is impossible to believe that Lizzie did not know what was happening-that she knew nothing about the plot. With Abby’s time of death a little “wonky”, as to the exact moment, there is room to believe that Abby died very early on and could be in the time frame where Morse could have managed it and taken a street car down to the Emery house to establish his alibi. It seems hard to believe that someone just 21 this month has accomplished so much so soon! But the handsome and dapper Mr. C. has managed a great deal in a short time and has returned this year in the role of Undertaker James E. Winward- Lizzie’s mortician of choice for her father’s funeral. Mr. Winward had his offices at #13 South Main at the time of the murders, and was very busy overseeing the details at the scene of the crime on August 4th. 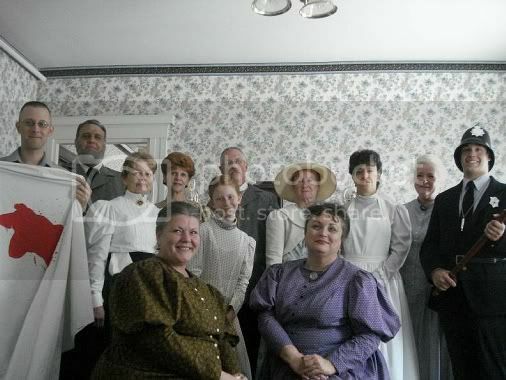 The funerals were held on Saturday, August 6th from the sitting room of the Borden’s home. Andrew truly is an “old soul” and captured Mr. Winward’s proper diction and manner, impeccable sartorial elegance, and genteel mannerisms down to the nth degree! He has been on stage since he was 5 years old and has performed with The Little Theatre of Fall River, Trinity Repertory Company, New Bedford Festival Theatre, Bristol Theatre Company, and other local community theatre groups. Apprentice Funeral Director & Embalmer with Nickerson Funeral Homes on Cape Cod. He is member of The National Morticians’ Honor Fraternity: Pi Sigma Eta (Alpha Omega Chapter). Originally from Somerset, MA, Andrew currently lives in Wellfleet, MA. and enjoys community theatre, Victorian funerals, historic buildings, and genealogy. And who would Andrew say is guilty of Murder Most Foul? With regret, Miss Lizzie! One of the few actual Fall Riverites in the cast, for Colleen,”Lolly”, Lizzie Borden is a family affair! Cousin Andrew, ( Undertaker Winward) was a lively addition to the cast in 2007 and 2008, and son Logan is also an employee at #92. Colleen brings plenty of acting experience to any role she plays and has, in addition to a beautifully melodic speaking voice, an effortless ability to become the character. Alice Russell, Lizzie and Emma’s neighbor over many years, was in a unique position to observe the doings in the house after the murders as she stayed with the family for some days. It was Alice who testified to seeing Lizzie burn a dress in the kitchen stove on the day after the Bordens’ funeral, and Alice’s testimony which was a deciding factor in indicting Lizzie. Alice Russell is often voted the witness with whom most people would love to have had a private interview! Her testimony about Lizzie’s visit on the night before the murders hinting of poison and her father having an enemy makes riveting reading. 1. I was born and raised in Fall River and am living back in the city after an absence of about five years. 2. I started acting and singing when I was about 11 years old. I’ve had the good fortune to play both Anastasia Romanov and Lizzie Borden in plays about their lives. The Lizzie role was for a student directed production of Sharon Pollock’s Blood Relations produced for the Centennial Conference at BCC. Mine was the dual role of Lizzie/Bridget. During my “mis-spent” youth, I was part of an all originals band called first Explorer, and then Internal Affairs. During my stint with them we were lucky enough to open shows for both The Marshal Tucker Band, and Charlie Sexton. I’ve worked at King Richard’s Faire for the last 17 years, and will be back there again this season. 4. Personal interests include: Singing, making beaded jewlery, baking pastries and working with chocolate, a bit of sewing, and tramping around cemeteries, because it’s fun. 5. Ahhhh, who committed the murders, indeed! I’m fairly unpopular I think, in that I believe there were actually two murderers, and that neither one of them was Lizzie! I believe John Morse committed Mrs. Borden’s murder. Who did the second one? When I figure that out, I’ll write my book! 6. Other facts about me: Hmmmm…My hair is pink, my nose is pierced, and I wear combat boots as every day shoes. The rest is subject to change without notice! It’s hard to believe that August 4th was Ted and Lorraine Gregoire’s first plunge into the dramatic arts. The pair, now married for 36 years, was as calm and confident as Tracy and Hepburn! Both of them were born in Webster, MA. but now live in Dudley, MA. Ted works in the Security Dept at Commerce Insurance in Webster, MA. 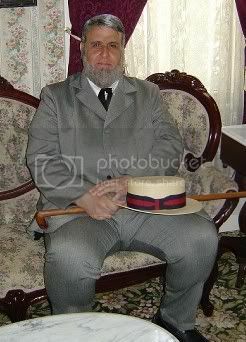 His dapper and distinguished bearing lent a real believability to the role of Dr. William Dolan, city medical examiner. There’s something about a moustache! Lorraine works at Gentex Optics in Dudley and is part of the polarized division that makes polycarbonate lenses for prescription sunglasses. Miss Manning was an ideal part for Lorraine, whose natural friendly “approachability” and skill at ad libbing on the spot gave visitors the feeling it was really 1892! Ted thinks Uncle John did it. Lorraine thinks it was a collaboration between Emma, Lizzie and Uncle John, with Bridget getting caught up in the middle, and just wanting to get out and away without having to say any more than she had to. Ted and Lorraine are both Second Street Irregulars and members of the Noble Order of Mutton Eaters. Stay tuned for more great things from this pair! Miss Manning, a.k.a. Lorraine Gregoire in real life, posed as The Fall River Herald’s Ace Girl Reporter out under the “pear trees” of #92’s parking lot on August 4th. Dressed in a green plaid summer cotton frock with jaunty black straw hat, Miss Manning had her steno pad in hand to interview guests and visitors as they exited the Borden cellar. As history records, John Cunningham, the chap who was ambling down Second Street after exiting Wade’s market, overheard Mrs. Churchill exclaiming to a friend in front of Hall’s Livery about the shocking assault on Andrew Borden. Cunningham, being an enterprising and helpful sort of guy, beat feet to Gorman’s Paper and Paint Store down the end of Second Street and rang up several newspapers and eventually got around to calling the police too! Mr. Manning, from the Herald, was soon dashing up to #92 in his carriage as one of the first on scene. We had a “Miss Manning” this year, who filled a much-needed role of transitioning guests from the gift shop to the house, setting that 1892 tone immediately, and continuing it at the exit. Visitors were amused, and naturally very chatty about what they had seen inside. Miss Manning’s easy, friendly warmth and vintage charm disarmed the crowds- for who in this day and age doesn’t enjoy escaping into the Past- even for a little while? And of course- EVERYBODY wanted to give their opinions on whodunnit! Read all about Miss Manning’s Big Day in the Pages section to the right. This year Ben, who works at the Second Street house whenever he can sandwich in a day between performances and school, created a first-time role- that of Detective Seaver. In years gone by, Ben has played Mr. Cunningham, the fellow who was crossing the street after coming out of Wade’s Market and overheard Mrs. Churchill exclaiming about the killings to a man she knew in front of the livery. Ben hails from Charlestown, R.I. where he has lived his whole young life. He works as a PASS Direct Services Worker thru CranstonArc, serving adults and children with physical or mental disabilities, and has impressive stage credentials. He is currently a junior at the University of Rhode Island majoring in theatre. Upon completion of graduation requirements next year, he will be a professional actor with a Bachelor of the Fine Arts degree with a focus in acting. Ben joins Jeff in thinking Lizzie did the deeds! Thanks to this year’s August 4th cast! Applause applause! The Lizzie B&B day manager, Dee Moniz, designed some great tickets this year. After last year’s crowd and sell out by noon, this year she decided printed tickets were the way to go- and it sure made things run so much more smoothly! This was the first time this was tried and it will be a return engagement NEXT August 4th! Thanks, Dee, from all the P.E.P. Players!